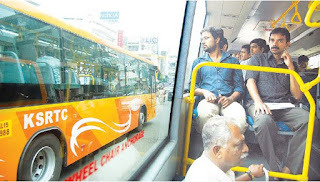 The three glasses of a Low Floor bus was broken when a private bus(Sandhya Travels) hit from right side.This incident happened at East Fort.The Low Floor bus was coming from Airport and about to leave to Kowdiar.Now KSRTC has claimed 60,000 INR as compensation..
Now do anybody want to "KISS" this Low Floor beauty? ?Wait a minute..Please confirm that you have enough money with you or bank balance to pay as compensation.. Thanks Sujith, I think you are a die hard fan of our KSRTC.Me too..